Since it's Valentine's Day, and we could all use a little reminder in all the ways we can show ourselves a little more love and appreciation, I couldn't be more excited to share this news with you all. I worked with Philadelphia-based illustrator Monica Lynch to create a "15 Ways to Self Love" print for your home. The poster offers 15 different ways to show yourself some love. Hang it on your wall, above your bed, on the fridge, or even in a frame on your desk. a closeup of the poster! The poster comes framed or unframed, and in a variety of sizes so you can really make it your own. learn to trust your gut - it always leads the way. I have one in my kitchen too. The print (above) includes 15 ways to express love for yourself. Most of them (12 out of the 15 to be exact) cost no money. 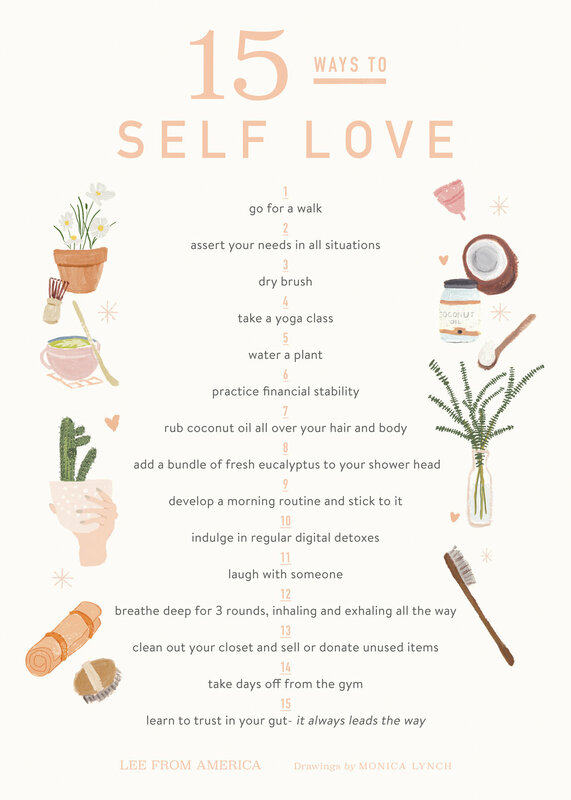 Self love and self care doesn't have to be pricey- sometimes it can be just a little walk around the block or a few deep breaths after reading a stressful email. All these little actions truly add up to make a big difference in my healing journey. They are habits I incorporate into my own life on a daily basis. I am excited to be sharing them with you so you can take them into your own home and make them your own practices. All prints are sold through Society6.